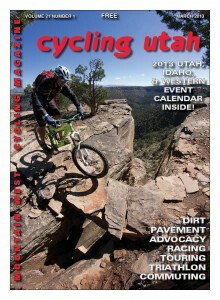 2013 Utah and Regional Bicycling Calendar of Events in Cycling Utah’s March issue! The 2013 calendar of bicycling events is inside our downloadable March 2013 Issue . The issue is available in any bike shop in Utah, S. Idaho, Wyoming, W. Colorado, N. Arizona, and Nevada. It is also available at many other locations along the Wasatch Front. We list all of the Utah and regional road touring, road racing, swaps, festivals, triathlons, mountain bike races, mtb festivals, cyclocross, and more.